We are pleased to announce the release of the latest version of Pirform. This release includes new pre-release support for EICs, improvements to the inspection schedules for EICRs and EICs and a number of other fixes and improvements, in particular to the 2018 MW. Update: 2019.2.1272 was not allowing boards to be excluded from 2018 EICs and EICRs, which is now fixed in 2019.2.1274. 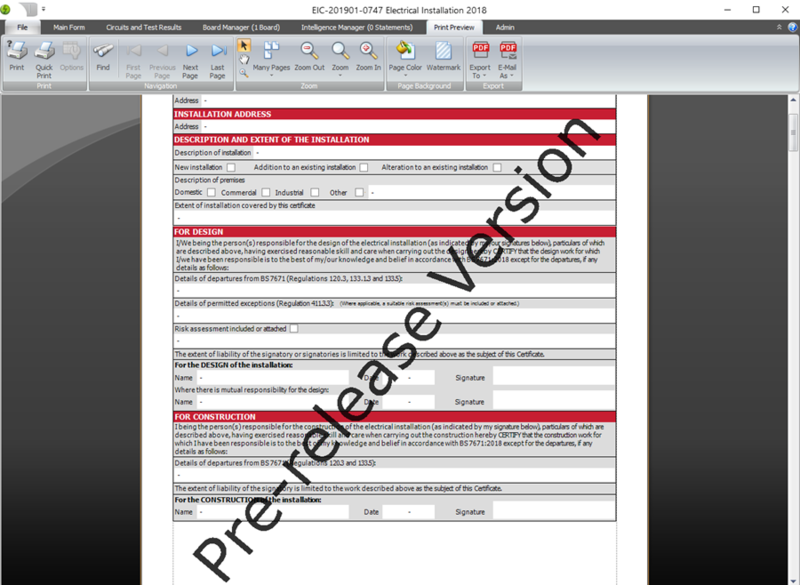 Pirform now has direct support for pre-release electrical installation certificates. You can mark an EIC as a pre-release certificate in certificate options. This will enable entering and reporting of observations in the EIC. And the certificate is given a watermark to identify it as a pre-release version. 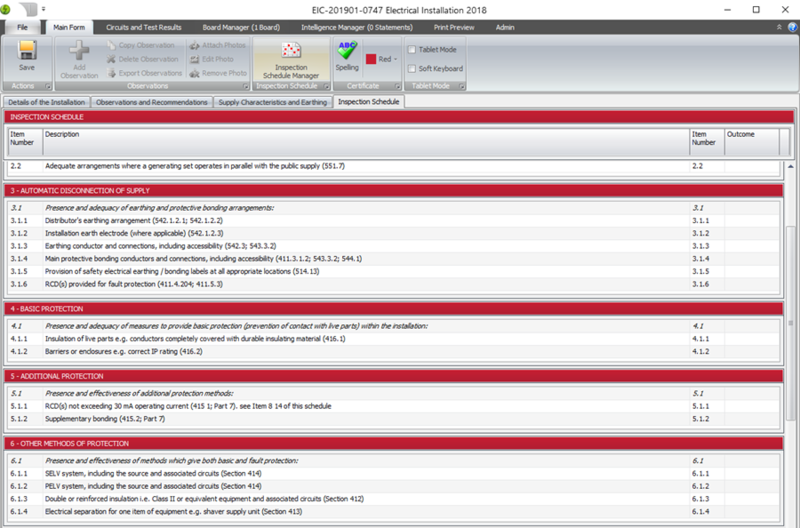 We have improved the way you view and work with schedule items in the EIC and EICRs. We now show items that are sub-headings. You can now also see the item numbers right next to the code, making it easier to track the item you are working on. New: MW 2018 PDF now shows description of the premises. 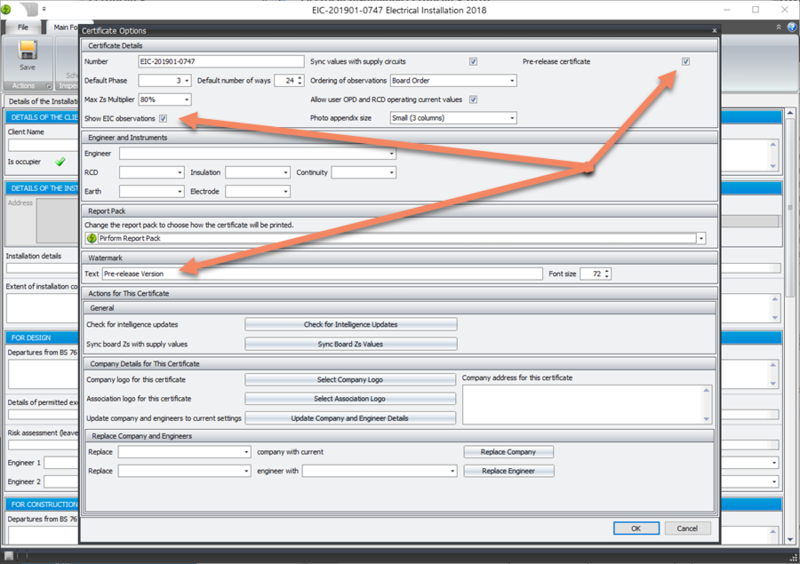 New: EIC schedule item sections A-D added (available when experimental features in Pirform Options is on). New: can now copy an observation when working in board observations. New: EICR 2018 now allows recording of the extent of sampling and the reason for the next inspection time interval. Change redundant lookups removed (supply OPD type and OPD nominal current rating). Change: removed duplicated values in OPD rating lookup. Change: increased column widths in circuits and test results. Change: increased certificate form width. Change: Zs value in Part 3 was incorrectly showing board Zs. Change: date of works now shown in MW 2018. Fix: circuit details header was not printing if only one circuit printed on the last page. Fix: combination of increasing number of ways and then merging all circiuts caused a crash when previewing. Fix: photos imported along with certs. Fix: pressing delete on circuit voltage now clears the value. FIx: circuit polarity and test button operation again shows pass before fail when clicked. Fix: certificate number missing from lighthing PDFs. 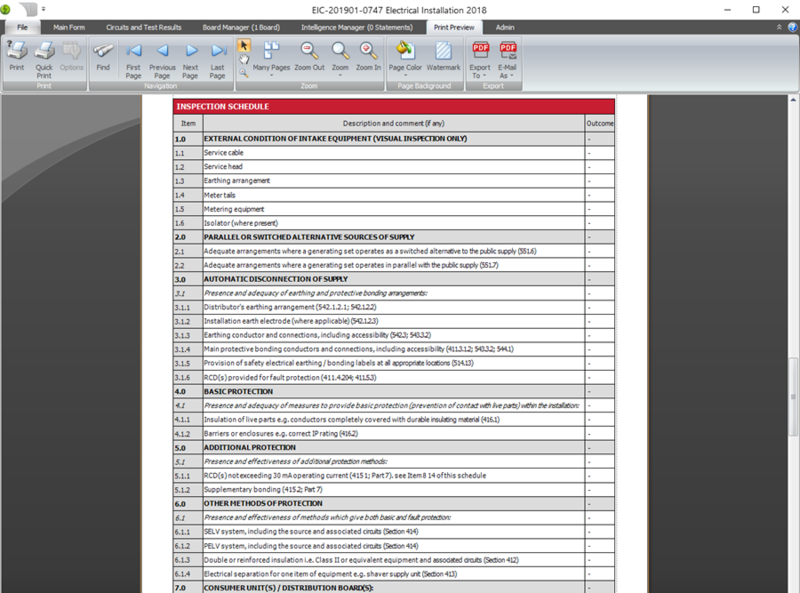 Fix: insulation resistance PE now copied when creating from EIC/EICR. Fix: fixed bad report formatting (use of ExpressionBinding instead of DataBindings). Fix: circuit clear data now clears voltage and AFDD test button values. Fix: setting and clearing circuit AFDD caused NO to show in PDF. Fix: lighting PDFs did not respect colour selection. 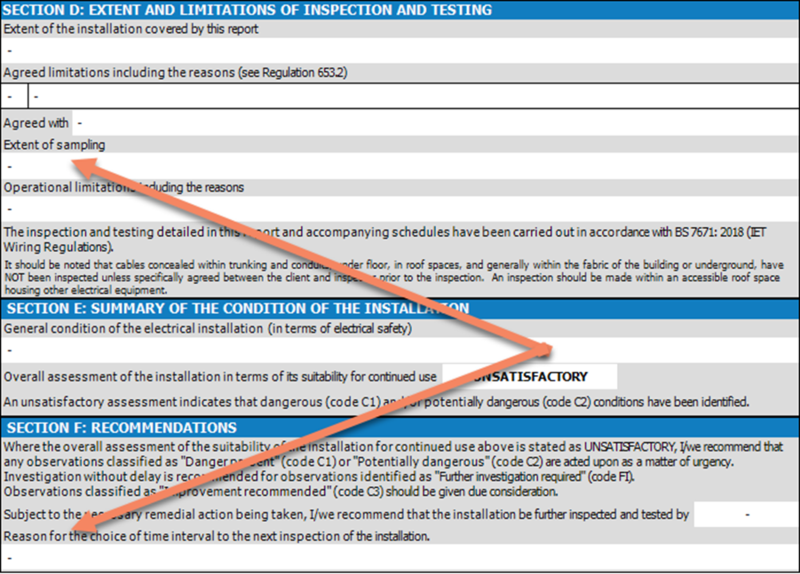 Fix: limitations were not showing correctly in PDF for EICR 2015 and 2018. Fix: EIC 2018 was always showing 2 phase 3 wire selected in PDF. Fix: can now create EIC and MW 2018 can be created from 2015 versions. Fix: MW circuit conductor CPC lookup control was not working. 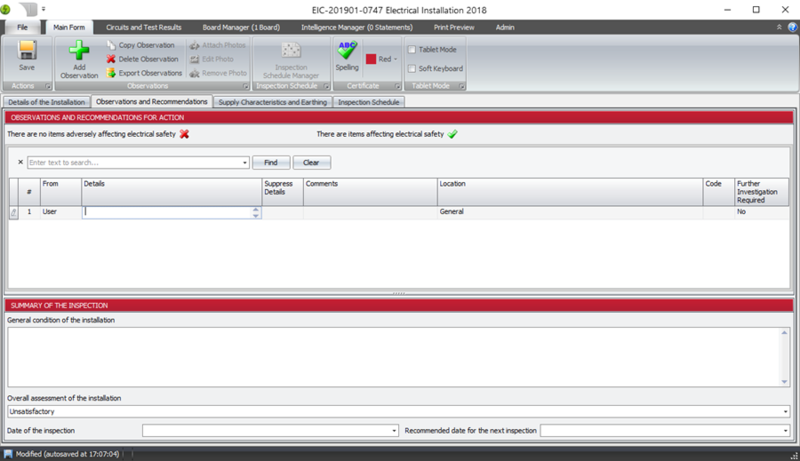 Fix: default selection for new certificate changed to EICR 2018.